Leicester Tigers Academy wing Leo Gilliland dotted down in Wales U19’s 10-try thriller against Japan High Schools last night. Wales led 26-12 at the break, but the Japanese side threw caution to the wind in the second half and entertained the Cardiff Arms Park crowd with some stunning running rugby to score three tries of their own. 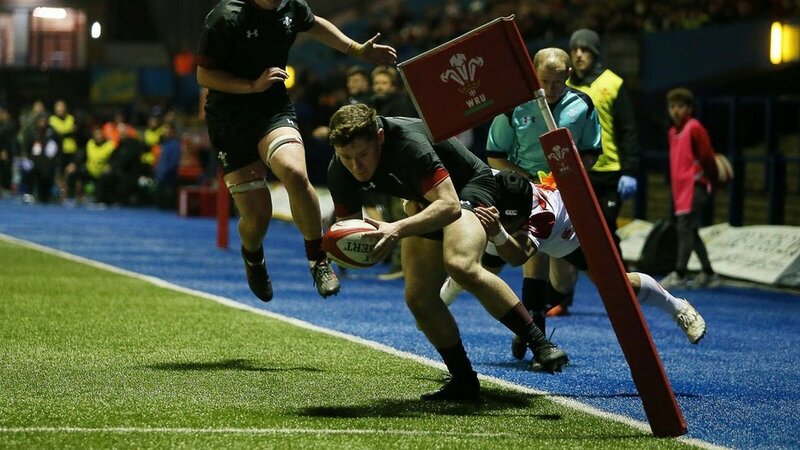 In a topsy-turvy final 40 minutes, the Welsh defence were stretched continuously by the rapid Japanese side before Gilliland showed his deftness of touch to score in the corner and put the home side 31-17 in front with 10 minutes to go. The visitors then threw everything at Wales, running the ball out from underneath their own posts. Hibiki Yamada finished off one length-of-the-field effort with Kanji Futamura scorching over in the corner with another long-range effort. Despite a quickly-taken conversion dropping over the bar, referee Chris Busby blew time on Japan’s comeback with Wales glad to hear the full-time whistle and take the honours over the visitors for the second time in five days.